Yes, this might seem odd, but chocolate and zucchini muffins are delicious! Having just finished a series of recipes featuring zucchini, I had to include these slightly unusual sweet treats. The muffins don't overwhelmingly taste like zucchini, but zucchini does adds a lovely texture to the muffins and keeps them incredibly moist... and who could say no to a little added dose of vegetable in the day? I really like coming up with different recipes around one ingredient. Not only does it show the wonderful range of produce like zucchini, but it also allows you to play with what's in your fridge. Do you ever buy a basket of zucchini, tomatoes or lemons to use for a specific recipe and then aren't sure what to do with the rest? Well, that used to happen to me a lot, which is why I like to plan a couple recipes around a same ingredient to spice things up a little and make sure not to waste food. In a small bowl, mix the flour, baking powder and baking soda. Grate the zucchini and reserve. Melt the chocolate in a double boiler, and reserve. In a separate bowl, whisk the oil, eggs, vanilla extract and sugar. Once incorporated, whisk in the flour mixture in small batches. Add the grated zucchini, and chocolate and mix. Line a muffin pan with liners and add a big ice cream scoop of muffin batter into each muffin cup. Bake for 15-18 minutes, or until a toothpick inserted in the center of the muffin comes out clean. Leave to cool on a cooling rack before serving. Enjoy! These muffins look really good! Can't wait to try them! If you put a veggie in it and it has chocolate too, it's definitely health food in my books! What a great way to incorporate a veggie into my kids' "cupcakes"! As we all know, everything is better with a little addition of chocolate. Even zucchini. This is one of my favorite combinations! Who knew zucchini could be so good when baked? if I hadn't seen the photo first, I'd probably say, "zucchini... no thanks", but yum. might have to try this out. I've only tried zucchini cake. Can't imagine how zucchini+chocolate would taste like but they do look lovely! Yum, chocolate and zucchini. I used to help out at the University weekly dinners that had to be vegan and we always had some sort of chocolate cake with zucchini for dessert. I miss it! So we finally decided that we will be going to the photography show tomorrow. Did you end up going? These look so good, I love choc. with my zucchini bread. Awesome looking muffins! I love chocolate zucchini bread, so I'm sure I'd LOVE these! Choc & zucchini just works. I experimented earlier this year and came up trumps. Nice work! Choc & zucchini just works! Such a good combo of decadence and healthy ingredients. I experimented earlier this year and came up trumps. Nice! uhmm they look soo tastefull! I'll have to agree, zucchini and chocolate go really well together. Can't believe it's that season already. I love zuchinni! I always add it in muffins and cookies! Obviously I copied the recipe! These muffins look absolutely delicious! Zucchini and chocolate are a wonderful combination. This looks nice eventhough I havent tasted it. Very nice photography too. I get so hungry just looking at your photos. I love zucchini bread and these zucchini chocolate muffins look great! I'll have to remember these when I'm up to my ears in zucchini this summer! I'm on a zucchini kick lately...never would have thought to pair zucchini and chocolate but I am very intrigued now!! These look delicious! Your blog is awesome and I'm loving your photography!! Thanks for stopping by and visiting me!! Wow... these look fantastic. I love chocolate and zucchini. 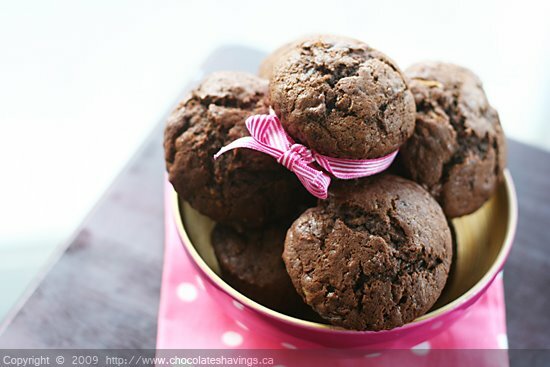 I love the pictures of chocolate and zucchini muffins... so delicious. My most favorite chocolate cake is actually my chocolate zucchini cake. It's absolutely the best. I also make chocolate zucchini muffins and so needless to say, it tastes good too. I love zucchini. Just tried these muffins. They tasted great but I found them dry....possibly from over mixing the dry and wet together?? ?